TANGHALANG PILIPINO (TP), the resident theater company of the Cultural Center of the Philippines (CCP), is proud to present the 2014 Summer Theater Adventure, a month-long program of various theatrical activities in different age levels designed to unleash the creative potentials of aspiring theater artists. TP’s acting workshops have been highly-acclaimed by parents, students and educational institutions for the intensive training and excellent experience it imparts on the participants. 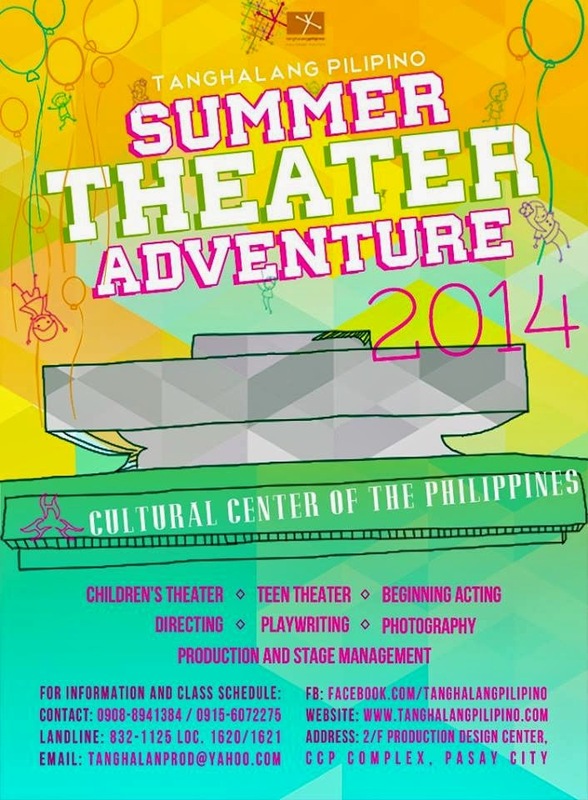 The 2014 Summer Theater Adventure is composed of classes for children, teens and adults facilitated by some of the country’s most outstanding thespians and practitioners in the field. Special lectures are also given by TP’s outstanding alumni. Each workshop culminates in a recital held at the CCP – Tanghalang Huseng Batute, where students get the chance to be seen by talent scouts. Creative dramatics for children using games, storytelling techniques, movement, music and masks as tools of expression. Participants perform in a showcase production at the end of the course. An introduction to performance skills for young adults, the workshop integrates creative drama, music, writing, movement and visual arts to explore themes concerning the youth. Script analysis and voice for theater are likewise incorporated in the course. A practical application of the rudiments of acting, including concentration, spontaneity, improvisation, confidence, body and voice preparation, characterization and script analysis to create a unique and authentic life on stage. Organizing the production, communicating across different disciplines, and keeping everything running smoothly. Learn about the seamless management of the technical as human aspects of a production.